Genotype is the genetic makeup (set of genes) of an individual organism or cell. Genes, the units of heredity in living organisms, are encoded in the organism's genetic material, which comprises those segments of DNA that are both transcribed into RNA and further translated into amino acids linked together to form proteins. All cells in an organism contain the same DNA but each cell, such as those in the eyeball or the tongue, uses only a selected set of those genes as templates for making the proteins needed by that cell. The inherited genotype is the overarching template from which is produced a complex, dynamic, and constantly changing collection of proteins that interacts with the environmental influences on each cell of the organism to yield the phenotype, the total of observable characteristics of the individual, including anatomical, physiological, biochemical, and behavioral (Mayr 2001). In the interaction between genotype and environment, the genotype determines the potential and limitations of that phenotype. An important clarification is that in this case, "environment" refers to the environment of each cell, so environment includes not only influences outside the organism affecting the skin and sensory organs, but also the influences inside the organism affecting a particular cell. Epigenetic factors are those environmental influences on a cell that can affect which of the genes in the DNA are selected by that cell to be expressed as proteins. In sexual reproduction, two organisms each contribute one gamete to yield together a combination of genetic material that becomes the unique genotype of the descendant. With the exception of identical twins, each human being has a unique genotype; individual uniqueness is further assured because the environment affects phenotypic expression of the genotype. The discovery, in recent decades, of epigenetic factors, which have been identified as including not only molecules in the body but also electromagnetic waves and thought patterns in the brain, opens the way for important and ongoing research into the relations between mind and body(Lipton 2005). Religions typically emphasize that the the whole person involves a spiritual component (soul or spirit) and spiritual environment (such as the history of past actions). From this perspective, the interaction of genotype and physical environment would be affected also by the spiritual factors. 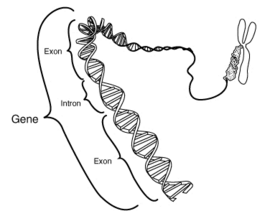 This stylistic schematic diagram shows a gene in relation to the double helix structure of DNA and to a chromosome (right). Genes are encoded in an organism's genetic material—DNA or RNA—and have a central influence on the physical traits (phenotype) of the organism. The Sequence Ontology Project (2007) defines a gene as: "A locatable region of genomic sequence, corresponding to a unit of inheritance, which is associated with regulatory regions, transcribed regions, and/or other functional sequence regions." During reproduction, genetic material is passed on from the parent(s) to the offspring. Thus, the genotype is hereditary. Genetic material can also be passed between un-related individuals (for example, via transfection, or on viruses) or may be altered by mutations. Non-hereditary DNA mutations are not classically understood as representing an individual's genotype. Hence, scientists and doctors sometimes talk, for example, about the (geno)type of a particular cancer, thus separating the disease from the diseased. While codons for different amino acids may change in a random mutation (changing the sequence coding a gene), this does not necessarily alter the phenotype. One's genotype differs subtly from one's genomic sequence. The genome of an organism is its whole hereditary information, as encoded in the DNA (or, for some viruses, RNA). This includes both the genes and the non-coding sequences of the DNA. The term was coined in 1920, by Hans Winkler, as a fusion of the words gene and chromosome (Lederberg and McCray 2001). More precisely, the genome of an organism is a complete DNA sequence of one set of chromosomes; for example, one of the two sets that a diploid individual carries in every somatic cell. The term genome can be applied specifically to mean the complete set of nuclear DNA (that is, the "nuclear genome") but can also be applied to organelles that contain their own DNA, as with the mitochondrial genome or the chloroplast genome. Thus, a genomic sequence is an absolute measure of base composition of an individual, or a representative of a species or group. It includes functional areas of the DNA and non-functional, "junk DNA." On the other hand, a genotype is a locatable region of a genomic sequence, involving a functional region, and typically implies a measurement of how an individual differs or is specialized within a group of individuals or a species. So typically, one refers to an individual's genotype with regard to a particular gene of interest and, in polyploid individuals, it refers to what combination of alleles the individual carries. The genotype-phenotype distinction must be drawn when trying to understand the inheritance of traits and their evolution. The genotype of an organism represents its exact genetic makeup, that is, the particular set of genes it possesses. Two organisms whose genes differ at even one locus (position in their genome) are said to have different genotypes. The transmission of genes from parents to offspring is under the control of precise molecular mechanisms. The phenotype of an organism, on the other hand, represents its actual physical properties, such as height, weight, hair color, and so on. Genotype and phenotype are not always directly correlated. Some genes only express a given phenotype in certain environmental conditions. Conversely, some phenotypes could be the result of multiple genotypes. An example to illustrate genotype is the single nucleotide polymorphism or SNP. A SNP occurs when corresponding sequences of DNA from different individuals differ at one DNA base, for example where the sequence AAGCCTA changes to AAGCTTA. This contains two alleles: C and T. SNPs typically have three genotypes, denoted generically AA, Aa, and aa. In the example above, the three genotypes would be CC, CT, and TT. Other types of genetic marker, such as microsatellites, can have more than two alleles, and thus many different genotypes. The distinction between genotype and phenotype is commonly experienced when studying family patterns for certain hereditary diseases or conditions, for example, hemophilia. Sometimes people who do not have hemophilia can have children with the disease, because the parents each "carried" hemophilia genes in their body, even though these genes have no effect on the parents' health. The parents in this case are called carriers. Healthy people who are not carriers and healthy people who are carriers of the hemophilia gene have the same outer appearance (that is, they do not have the disease), therefore they are said to have the same phenotype. However, the carriers have the gene and the other healthy people do not (they have different genotypes). Genotyping refers to the process of determining the genotype of an individual with a biological assay. Current methods of doing this include polymerase chain reaction (PCR), DNA sequencing, and hybridization to DNA microarrays or beads. The technology is intrinsic for test on father-/motherhood and in clinical research for the investigation of disease-associated genes. Due to current technological limitations, almost all genotyping is partial. That is, only a small fraction of an individual’s genotype is determined. New innovations promise to provide whole-genome genotyping in the future. When testing for father-/motherhood, scientists typically only need to look at 10 or 20 genomic regions (like single nucleotide polymorphism, SNPs) to determine relationship or lack thereof. That is a tiny fraction of the human genome, which consists of three billion or so nucleotides. When genotyping transgenic organisms, a single genomic region may be all that scientists need to look at to determine the genotype. The mouse is the mammalian model of choice for much of medical research today. A single PCR assay is typically enough to genotype a transgenic mouse. Lederberg, J., and A. T. McCray. 2001. "Ome sweet 'omics: A genealogical treasury of words." The Scientist 15(7). Lipton, Bruce. 2005. The Biology of Belief: Unleashing the Power of Consciousness, Matter, and Miracles, Santa Rosa, CA: Mountain of Love/Elite Books. ISBN 0975991477. Sequence Ontology Project. 2007. Gene. Sequence Ontology Project. Retrieved June 3, 2007. This page was last modified on 5 September 2008, at 13:01.